Risk Management, SWOT or Strengths, Weaknesses, Opportunities, Threats. Understanding what is in the Public Domain, Fair Use, copyright infringement and what isn’t. How to determine want is allowed and what isn’t. Guidelines, tools, and articles for better practice. IPR Risk Assessments: Risk Management resources/procedures. Digitization selection decision tree: Decision making tree concerning digitization. InfoKit Risk Assessment: Risk management overview and information. IPR Support Risk Management Calculator: Calculator to determine risk management. Kevin Smith Making Creative Copyright (LJ): Article on copyright law. JISC legal: legal information concerning UK Scholarly digital resources. K. Crews & Copyright Instructors: youtube video lecture concerning copyright. Washington Post Policies and Permissions: FAQs regarding sharing/reprinting articles for patrons, etc..
Can I use this Picture? 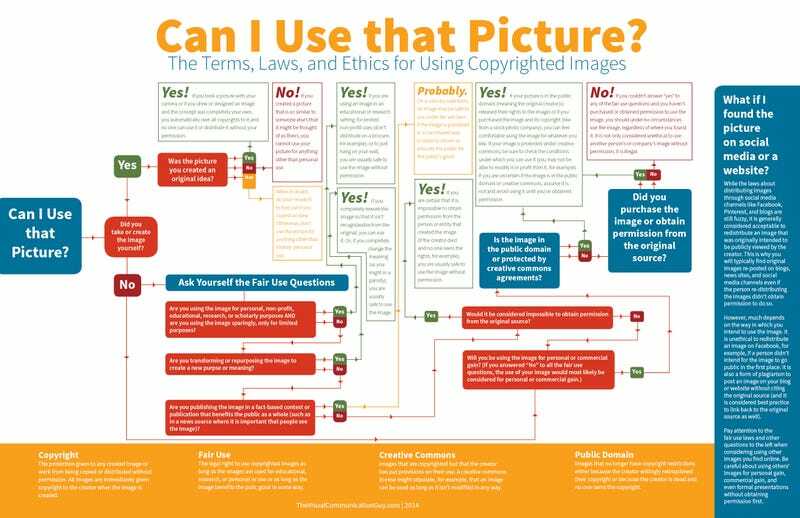 Decision Tree: A visual on determining whether or not to use an image.